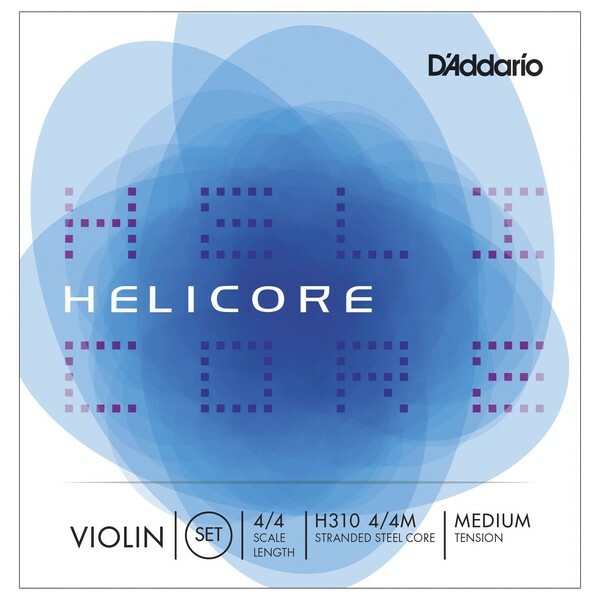 D'Addario Helicore violin strings are crafted from the finest quality materials to ensure a fantastic playing experience. Long lasting and reliable, with a rich, versatile tone, these strings are perfect for players from a wide range of backgrounds, including classical, folk, country and bluegrass. With a quick bow response and a smooth, comfortable feel beneath the fingers, these medium tension strings offer excellent playability, and the multi-stranded steel core delivers a warm, balanced tone ideal for a variety of genres and playing styles. The strings are scaled to fit a 4/4 size violin with a playing length of 13'' (328mm), and are packaged in special sealed pouches to protect them from any corrosion before they arrive. The E string included with the H310 set is a plain steel E (tin-plated high-carbon steel) with no winding.